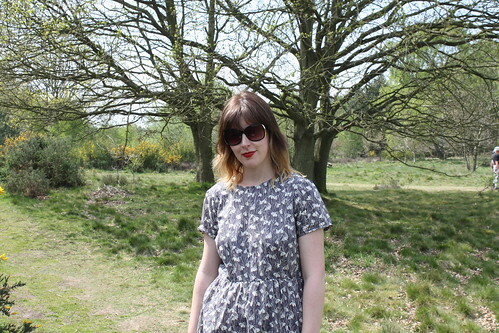 A short and sweet post to bring you The E Dress – the Easter dress, made during my Easter holidays from school. It’s another Avid Seamstress Day Dress, (my second of three) and for this version I treated myself to some beautiful Liberty lawn courtesy of Kat’s Fabrics. I think I paid around £35 for just over 3m. I followed the pattern just as last time, except I added about 2.5inches to the length. I still included pockets. One mistake I made was not to flip the pattern piece for the sleeves, meaning the snowdrops are actually upside down on them – but I don’t think it’s overly noticeable. 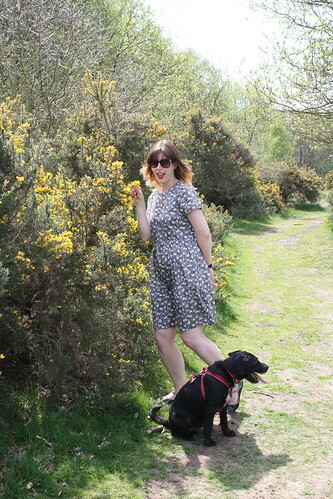 You’ll notice for this post I did something I *very* rarely do – got my legs out! I hardly ever have bare legs, especially in the UK. However, it was a beautifully sunny day, so I took the plunge whilst out for a dog walk. Please excuse the glare on your screens. Well another lovely dress.as Brucie would say didn’t. you do well.have you had to buy extra Wardrobes to hang all those pretty dresses in. What a gorgeous version of The Day Dress – very pretty! Your dress is lovely & Am quite envious of your finding Liberty so reasonably priced! Legs? Oh yes, I think I have some, somewhere. This is my favourite version of the three. Looks like a great pattern – glad you’ve found a TNT. Hahaha! Blinded by those legs :-0 !!! You should get yourself over here for a tan 😛 My legs are out almost daily now! Gorgeous fabric & I didn’t notice that the snowdrops were the wrong way!